In the late 1980s in Taipei, Taiwan, MTVs, or Movie Television clubs, were hugely popular establishments where you could rent not only a movie but a room with a TV and VCR in which to watch it. They’d throw in a drink, too, all for about 100 quai, or four bucks. In the lobbies of these places they’d hang framed photos of the big Hollywood stars of the day (Sylvester Stallone, Tom Cruise), along with some not-so-big stars (Phoebe Cates) and a few head-scratchers (Richard Dean Anderson of “MacGyver,” who was huge there). Invariably, among all these western faces, there’d be one Chinese guy: a big-nosed dude with a bashful smile and hair anachronistically feathered back. His picture, in soft-focus, always looked like the worst high school photo ever taken. “Who’s that?” I asked a Chinese friend one day. But if you’re living abroad, as I was, studying Chinese and teaching ESL, you want to experience some aspect of the culture you’re in, and more and more friends urged me to watch a Jackie Chan movie. Opinions varied, but a few suggested “Jing cha gu shr (Police Story)” as the place to start. I didn’t get the appeal at first. A bunch of Chinese guys running around, yelling and firing guns. A big car crash through the shantytowns of Hong Kong. An idiotic courtroom scene. What was the big deal? How was this different from other bad Hong Kong movies? It was a small moment that won me over. Jackie, playing Chan Ka Kui, a cop about to walk into a trap, confronts the high gate of an apartment complex. He doesn’t climb it. He bangs off a perpendicular wall, vaults himself over the gate, lands and keeps walking. In one take. I was stunned. When had I last seen such nonchalant grace? I rewound the tape to watch it again, and then began to pay more attention to the fight scenes, particularly one in a shopping mall in which he’s attacked by the villain’s flunkies. They don’t — as they would in a Hollywood film — improbably circle him and then take turns throwing punches. These guys all descend at once, four or five of them, and the result is some mixture of chaos and dance. It’s Fred Astaire with multiple partners. Who was this guy? I cobbled together bits of his storyline from Chinese friends. Apparently he’d trained at the Peking Opera. Some said he was an orphan. Others said, no, his parents sold him to the opera. Sold him? That couldn’t be right. Surely something was getting lost in translation. He performed all of his own stunts. Did I know that? In one movie, filmed in Yugoslavia, he’d been injured so badly he now had a hole in his head. Yugoslavia? A hole in his head? Surely something was getting lost in translation. When I returned to the states I brought a bootlegged copy of “The Young Master” with me and urged it upon friends. “You gotta see this guy,” I said. Most were dismissive, as I had been, but the more open-minded watched and were entertained. Kids loved him. The essence of Jackie’s early character, here as in “Snake in the Eagle’s Shadow” and “Drunken Master,” is avoidance — avoiding the training, avoiding the fight, avoiding the punch — and there’s nothing kids like better than avoiding stuff. They knew Jackie was a kindred spirit. For several years this ratty bootleg was my only connection to Jackie’s world. Then, for one weekend on its calendar schedule, the Varsity, a Seattle art-house theater, promised us “Police Story III: Supercop,” and I ran around trying to get anyone to go with me. No one would. It seemed no one in America knew Jackie and no one wanted to know. But I was buoyed by the long line at the box office and became giddy when the place was packed with an enthusiastic crowd who seemed to get it. All of us got to watch one of Jackie’s greatest stunts: he was dangling from a helicopter ladder and pulled crazily a thousand feet above Kuala Lumpur. No Hitchcockian camera tricks were necessary to inspire vertigo. Soon we were getting entire weeks of Hong Kong films. I loved it all: The Bom! Bom! Bom! Bom! drum opening as four red rectangles formed the Golden Harvest logo; the thrill when a small wooden bench comes alive in Jackie’s hands; the anticipation as the characters entered an early western restaurant/bar with a second-floor balcony — a sure sign that a beautifully choreographed fight was about to erupt. I’d leave the theater at midnight more energetic than when I arrived. He created one of the most recognizable personas in movies: the cheerful but determined civil servant who can fight a dozen men to a standstill — acrobatically, imaginatively, humorously — and remain humble and lighthearted. Hollywood action stars, in comparison, were deadly serious. They were testosterone-heavy mumblers who plodded through a storyline, spoke little, carried heavier and heavier guns, and fulfilled the one-man blitzkrieg fantasies of their mostly male audience. They looked strong and tough, but their bodies were the reason for their training — they trained to be looked at —while Jackie’s body was the result of his training: the happy byproduct of his martial arts and acrobatic skills. They trained to appear while he trained to do, and that difference is all over their respective movies. You know when you have a great secret — you’re in love, you’re planning a surprise party — and you almost buzz with the thrill of it, and you can’t wait to tell someone, to get it out, let the world know? That’s how I felt with Jackie. I didn’t just bug friends. I pitched publication after publication, national and local, but I kept running into the same problem. The gist of my article — the biggest movie star in the world was unknown in the U.S. — was tied to something not being sold, and, in today’s media, particularly in the entertainment press, articles have to be tied to something being sold. Nobody wanted it. In October 1994 I traveled to the Vancouver International Film Festival for the Canadian premiere of “Drunken Master II.” I’d already seen the film at the Varsity, but this screening promised more: Jackie himself, who was in Vancouver filming “Rumble in the Bronx.” The night of the screening turned out to be the day he broke his ankle jumping onto a boat, but he still showed up, in a cast and wheelchair, a bashful smile on his face. I shook his hand as he was wheeled down the aisle. I asked a question during the Q&A. I was thrilled. What can I say? I love the guy. “Rumble in the Bronx” was the picture that finally broke Jackie through to U.S. audiences. He was allowed on U.S. talk shows. He was profiled in magazines and newspapers. All of the articles I’d pitched two years earlier were now being written — by idiots — because they were tied to something being sold. It was both exhilarating and infuriating. “Rumble” exhibited both Jackie’s best (incredible fights, stunts and comedy) and worst (meandering plotline, street-bike villains, “I hope next time we meet, we will be drinking tea”), and it was dubbed in English; but it went to number one at the box office during a stagnant week in February 1996 and the floodgates opened. Dubbed and chopped-up versions of his movies appeared in quick succession. Miramax positively butchered “Armour of God II: Operation Condor,” cutting the film’s funniest scenes. “What have they done to my movie?” Jackie supposedly said. Hollywood may have embraced him, but it was a semi-insulting embrace. They didn’t try to turn him into something he wasn’t, as they had in the early ’80s — Japanese race-car driver in “Cannonball Run”; Clint Eastwood clone in “The Protector” — but they always stuck him with someone else for insurance: a funny black guy in one series (“Rush Hour”), a funny white guy in another (the “Shanghai” movies). These movies have the advantage of being OK, but they’re basically the same: Chinese girl is kidnapped; Jackie has to track her down despite the distractions of his American partner. Meanwhile, Jackie’s fights within them are slow and without imagination compared to his Hong Kong stuff. Compromise always tastes slightly sour. Now we have to put up with Keanu Reeves and Ben Affleck as martial arts masters, striking a pose and flicking their fingers forward in a “C’mon, let’s see what you’ve got” gesture. We have to put up with Jet Li as a villain instead of a hero. We have to put up with Chris Tucker. Imagine Clint Eastwood having to adopt a Chinese first name, and play villains and second-bananas to B-list Hong Kong stars who make fun of his bad American accent and American ways. Bu hao yisi. Hong Kong weeks at the Varsity died and I lost track of Jackie. His movies came and went and I didn’t notice. Friends I couldn’t drag to a Jackie Chan movie years earlier suddenly came up to me all enthusiastic about finally seeing one: “Rush Hour 2,” “The Medallion,” “The Tuxedo.” I’d smile. What do you say? 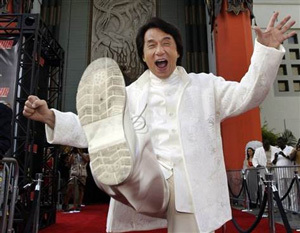 You say this: Jackie is in his 50s now and the best of his action movies are behind him. But they’re not behind us. They’re still out there if you want them: “Snake in the Eagle’s Shadow,” “Drunken Master,” “The Young Master,” “Project A,” “Wheels on Meals,” “Police Story,” “Armour of God,” “Dragons Forever,” Miracles,” “Armour of God II,” “Police Story III: Supercop,” “Drunken Master II.” Watch them in Cantonese. See Jackie as Jackie. Watch a movie star who would literally do anything for us. —Erik Lundegaard played “bad foreigner #12” in the Taiwanese kung fu comedy “Almighty Athletes.” This article was originally published on 8/6/07 on MSNBC.com.